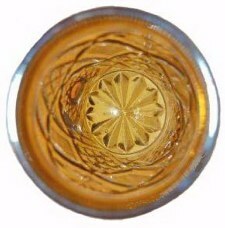 WHITE OAK Tumbler: This rustic looking tumbler having oak leaves and acorns in the design is found only in marigold. No matching pitcher has ever surfaced. 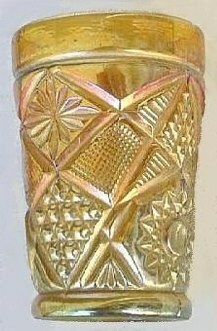 Tumblers do not appear often, and usually sell in the $100-$200 range. Manufacturer has never been confirmed, but U.S. Glass is “suspect”. 11 in. x 4.25 in. deep. 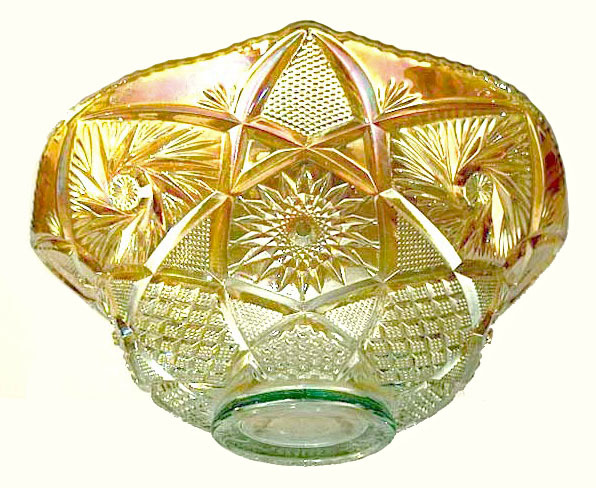 WHIRLING STAR: This punch bowl turned up in late 2007. Although the pattern had always been listed in marigold only, the base glass color of this bowl is clearly aqua or a green shade. Actually it is not so unusual when one considers the fact that other patterns such as Omnibus is found in green. Rick Kojis listed the bowl for sale, saying he had no matching base or cups. There must be some out there to be found? 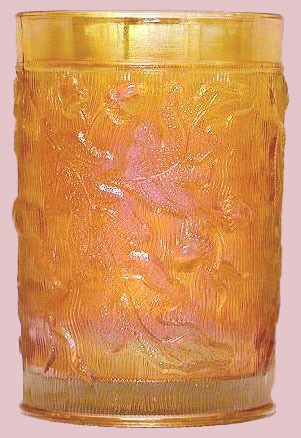 OMNIBUS Pitcher in amber base with marigold overlay. 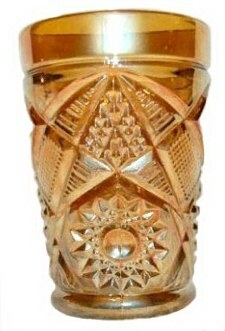 Base design on Honey Amber OMNIBUS tumbler. OMNIBUS 4 in. tall, in green base glass. 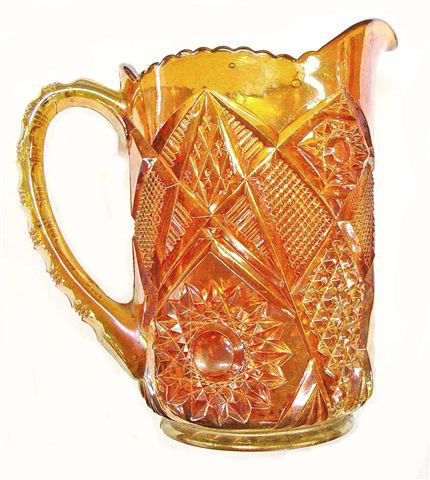 OMNIBUS: We display a honey amber pitcher with marigold overlay, a green tumbler and another in the familiar honey amber color known in various other U.S. Glass patterns. Examples in this pattern are not frequently found. While they do not command the dollar expenditure that well-known rarities do, they should not be overlooked for their definite attractiveness and scarcity. 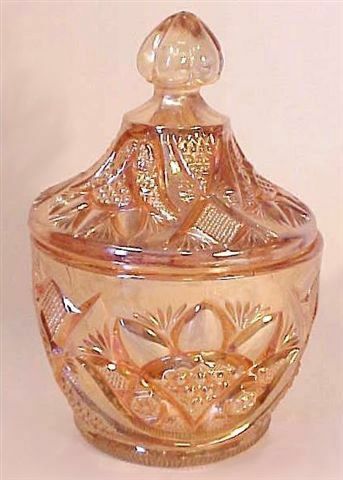 This mold is one used by the original United States Glass Co. but there was a time during the mid `80s when it was attributed to production by Orizaba, a Mexican firm. As with other molds which passed from one manufacturer to another, we must assume that is the case with Omnibus. A blue tumbler was reported early in 2009. Time and place of manufacture is the central question. BUCKINGHAM Sugar Bowl: While discussing our obscure Bullseye and Fan Sugar Bowl with Barbara Chamberlain, she announced that she too owned such a “find”! Her research indicates U.S. Glass as the manufacturer and we are quite pleased to display this piece for our viewers' assessment. BULLSEYE & FAN Sugar Bowl. Inside of bowl is iridized. Surface of the lid is iridized. BULLSEYE and FAN Butler Brothers Wholesale Ad. seen in US Glass A-Z. seen in the A-Z US Glass Book. BULLSEYE and FAN: Quite surprised to see this sugar bowl included in a Wroda Auction, along with another example of it which was cracked, we are left to assume that since we have not seen another example during our 37 years of search over a large area of the United States, it must have been one of the examples which were sent to Western Canada following manufacture. These two sugars were included in a longtime collection from that part of Canada. It is interesting that no other table set parts have surfaced in Marigold for either Buckingham or Bullseye and Fan. Perhaps they were intended as covered candy dishes? 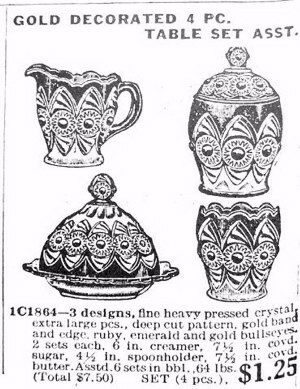 Assortments of sugar bowls were advertised in the Butler Bros. Catalogs. The first ad displayed in the Butler Catalogs used for our 1994 Reprints was for a footed water set, berry set and table set in crystal. Date of the catalog was Feb.- March 1907. 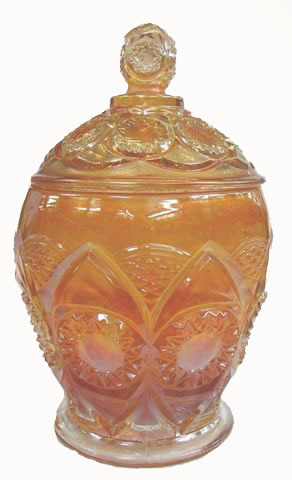 Perhaps the two marigold sugar bowls displayed here were part of a sugar bowl assortment produced for a “test run” in the early days of iridized production by U.S. Glass? We may never have an answer to that question, but none-the-less, we are pleased to own this example! 7.5 in. tall x 5.25 in. diam. x 7.75 in. handle to spout. 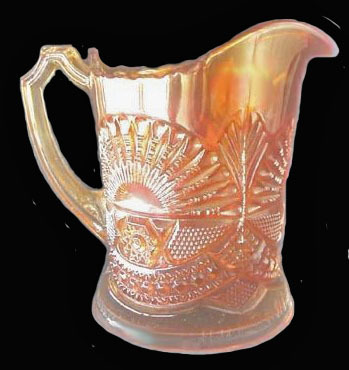 RISING SUN Pitcher: We know that several shapes in this pattern are now coming out of Argentina, but the moulds for Rising Sun originally belonged to U.S. Glass. 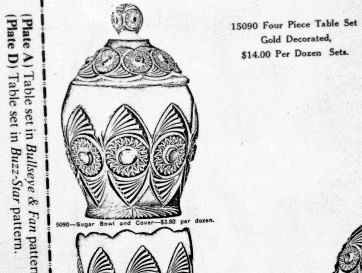 This exact pitcher design/shape is shown in the 1910 Butler Brothers Wholesale Catalog. We have not seen this particular milk pitcher with the flat bottom advertised for sale from Argentina. Perhaps that mould did not find its way “south of the border”? Quite a few of the water pitchers having a base pedestal are advertised on eBay. Behold, God is my helper; the Lord is with those who uphold my life. He will repay my enemies for their evil. Cut them off in Your truth. I will freely sacrifice to You; I will praise Your name, O Lord, for it is good. For He has delivered me out of all trouble; and my eye has seen its desire upon my enemies.